This one-night-only evening of music and comedy will include wild renditions of pop anthems, musical theater numbers, and a special guest appearance by the incomparable PATTI LUPONE and the genius JANEANE GAROFALO! Who knows? 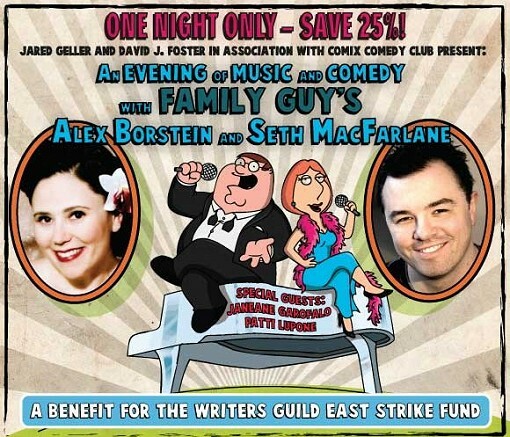 Maybe your favorite FAMILY GUY characters will stop by for a song or two! For 25% off tickets visit carnegiehall.org and use code WGA6020. Call CarnegieCharge at 212-247-7800 and use code WGA6020. All proceeds will benefit the Writers Guild Of America, East Strike Fund.